Distinguished guests encouraged hundreds of visitors to attend the College Festival centred around St Barnabas’s Day. 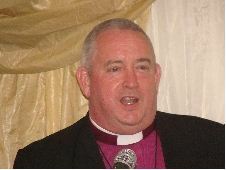 The Bishop of Southwark preached at the Festival Evensong on Thursday 9th June, which was followed by the annual Garden Party. 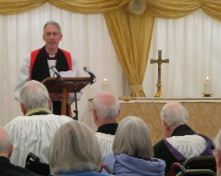 The marquee came to the rescue in unpredictable weather enabling the Bishop to continue mingling with residents, families and friends over tea. On Friday 10th June over a hundred diners joined residents of the College for Pimms on the lawns before sitting down to a five course banquet. Between courses of the meal, College Patron Mr Peter Ainsworth took centre stage as an auctioneer, inspiring generous guests to pay over £1000 for the lots on offer. After dinner, the Dean of St Paul’s, Bishop Graham Knowles, kept his audience laughing with anecdotes of his experiences in ministry. He also applauded the work of the College and encouraged his listeners to continue supporting it generously. The Festival Week ended with an Open Afternoon on St Barnabas’s Day itself, 11th June, when more visitors than ever came from miles around for tours of the College. 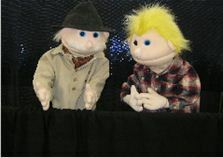 Peter and Diane Hellyer of Upbeat Puppets gave two performances with a huge range of characters ‘singing’ Christian songs. 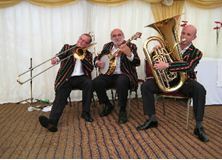 To complete the day, live jazz was provided throughout the afternoon by the ‘Rats’ – the highly popular Royal Ascot Trio. The Rats will be back playing again at next year’s Open Afternoon, Saturday 9th June 2012. The guest speaker at the Festival Dinner on Friday 8th June 2012 will be writer and humorist, Adrian Plass. To email your reservation for tickets to the Dinner, click here.